I am board certified in both Pulmonary and Critical Care Medicine, and have been caring for patients with a variety of acute and chronic lung diseases for more than twenty years. I have previous experience directing a respiratory therapy department, and currently oversee the Pulmonary Function Labs at URMC. I am an attending physician in the Medical Intensive Care Units at Strong Memorial and Highland Hospitals, and have extensive experience in managing patients with acute respiratory failure, pneumonia, sepsis, and multi-organ failure, using multiple ventilator modes and also patient-specific approaches to ventilator weaning. I emphasize a team approach in the MICU, and value the input provided by nurses, respiratory therapists, pharmacists, and other specialists in developing tailored care plans. I also see outpatients with asthma at the Mary Parkes Center for Asthma and Pulmonary Care, and work closely with consultants in Allergy, ENT, and Speech Therapy to develop individualized approaches to diagnosis and management. Dr. Georas was born and grew up in Providence, Rhode Island. He graduated from Brown University with a B.S. in Applied Mathematics and Biology in 1983, and then attended Brown Medical School (M.D., 1987). 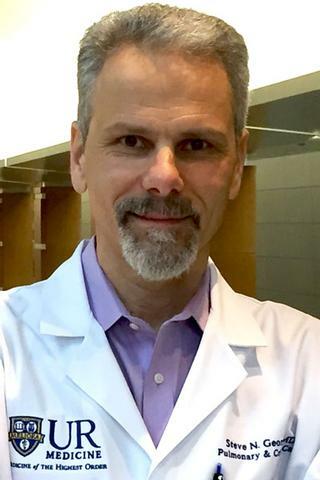 After Internal Medicine internship and residency at Duke University Medical Center, Dr. Georas moved to Johns Hopkins University for a Fellowship in Pulmonary and Critical Care Medicine, which he completed in 1994. From 1994 to 2006, he was a faculty member of the Pulmonary & Critical Care Medicine Division at Johns Hopkins, conducting research in the Johns Hopkins Asthma & Allergy Center. He rose to the rank of Associate Professor of Medicine and Director of Pulmonary Research. In July 2006, he moved to the University of Rochester Medical Center, where he served as Division Chief of Pulmonary & Critical Care Medicine until 2010. Dr. Georas directs a research group investigating mechanisms of immune cell activation in the lung in asthma and other diseases. He has authored numerous publications in this area, and has been invited to present his research at national and international meetings. He is active in peer review, and serves on numerous advisory panels and review groups for the NIH and other professional societies. Dr. Georas is Professor of Medicine, Environmental Medicine. Microbiology and Immunology at the University of Rochester Medical Center. From 1994-2006, he was a faculty member at Johns Hopkins University in the Pulmonary & Critical Care Division with a joint appointment in the Division of Allergy & Clinical Immunology, and Department of Environmental Health Sciences. He moved to the University of Rochester in 2006. Dr. Georas directs a research group investigating mechanisms of immune cell activation in the lung. Current studies are aimed at defining molecular pathways by which allergens and particulate matter activate epithelial cells and dendritic cells, leading to generation of maladaptive allergen-specific immune responses in asthma. A separate line of research is investigating how lysophosphatidic acid is generated in the lung, exploring the role of different LPA receptors in lung inflammation and immune responses. These studies should further our understanding of how the lung functions as an immune organ, with a long-term goal of alleviating the burden of immune-mediated lung diseases including asthma in susceptible human subjects. Dr. Georas also directs the Study of Asthma in Rochester (SOAR2), which is enrolling adult asthma patients who have frequent exacerbations in a prospective registry, with the goal of identifying new treatments for these patients who currently have limited therapeutic options. Georas S, Ransom N, Hillman S, Eliseeva S, Veazey J, Smyth T, Le K, Meddings J. "The leaky lung test: A pilot study using inhaled mannitol to measure airway barrier function in asthma." The Journal of asthma : official journal of the Association for the Care of Asthma.. 2018 Nov 16; :1-9. Epub 2018 Nov 16. Boulé LA, Chapman TJ, Hillman SE, Kassotis CD, O'Dell C, Robert J, Georas SN, Nagel SC, Lawrence BP. "Developmental Exposure to a Mixture of 23 Chemicals Associated With Unconventional Oil and Gas Operations Alters the Immune System of Mice." Toxicological sciences : an official journal of the Society of Toxicology.. 2018 Jun 1; 163(2):639-654. Georas SN. "All plugged up - noninvasive mucus score to assess airway dysfunction in asthma." The Journal of clinical investigation.. 2018 Mar 1; 128(3):906-909. Epub 2018 Feb 05.